Zenki Fudo 7 Layers Falls (前鬼・不動七重の滝) is one of the 100 best Japanese waterfalls located in southern Nara Prefecture. It is 160m tall seven steps waterfalls that have great views. Drive 169 south to Shimokitayama. Turn at Zenki Tozanguchi. Zenki Fudo Nanaju Falls is one of the 100 best Japanese waterfalls located in Shimokitayama, Nara prefecture. It is 7 steps waterfalls and 160m tall in total. The 3rd falls is about 80m tall. 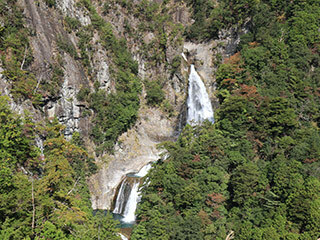 Because it is located in the deep side of the mountain, this falls was used to be the secret Shugendo Falls.